Interfacing's cloud-based SOP software will empower your organization to govern your continuous transformation through quality, performance and process procedure. 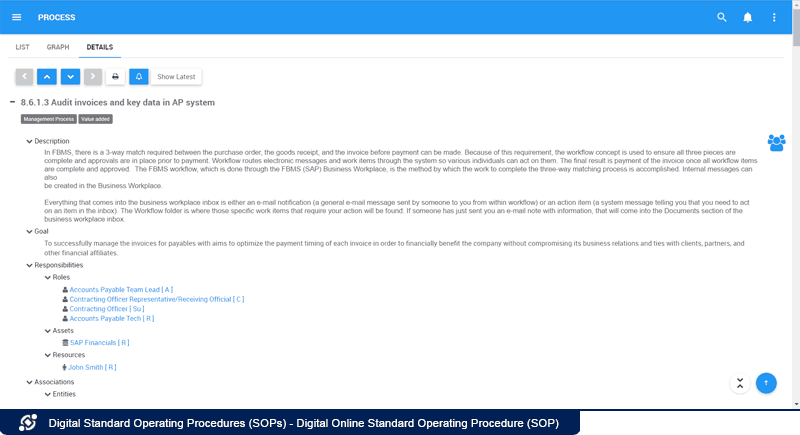 Interfacing’s cloud-based standard operating procedure (SOP) software aligns corporate policies to operations and bridges the gap between process and procedure management. 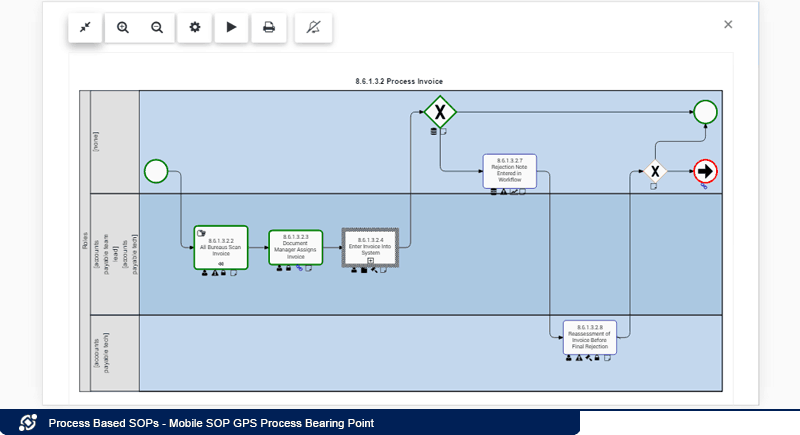 Allow users to quickly map process and identify gaps whereby procedure details are lacking or inconsistent. Ensure that content within users’ process SOP contain consistent and correct data without any manual maintenance effort. Safeguard that corporate policies, rules, laws and regulations are adopted within the process and procedures that they govern. Reduce on-boarding costs and standardize work practices across the organization. Available Anytime and Anywhere (mobile)! Gain access to your processes, procedures and documents no matter where you are directly on your phone, tablet or laptop! No employee will ever carry around user manuals wherever he goes and when there is a time in need (eg. a crisis whereby access to the disaster recovery procedure is imminent) they don’t have the time nor the patience to go fetch the procedure which often results in adhoc work-methods and additional errors. Hence, the amplified importance for employees to have easy access to information directly on their phone. Find what you need fast (even on your mobile)! Employees no longer have the patience to read entire guides and manuals and are used to a “Google” world whereby when you need something you search for it and expect immediate targeted answers. Just like Google, the EPC provides recommended results as the user types his search criteria and then upon submission lists out all results in order of the quality of relevance. EPC indexes ALL content captured within the repository, including all attributes, even within document content directly! 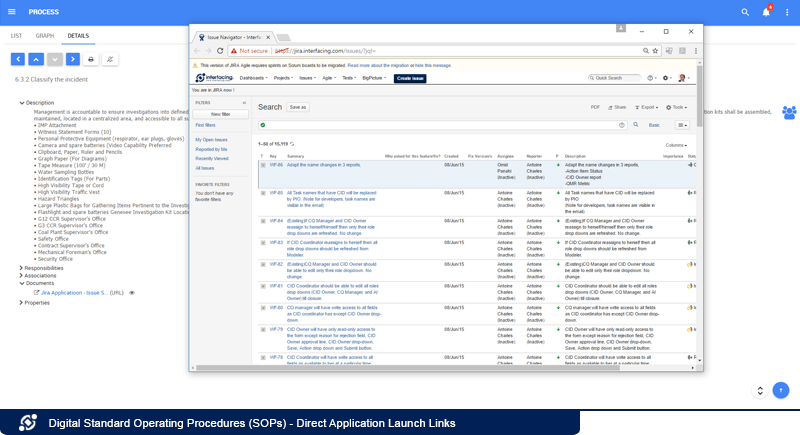 Instead of having to read a 200 page document from top-to-bottom, users can now navigate through their standard operating procedures step-by-step based on what they are doing and the decisions they make. 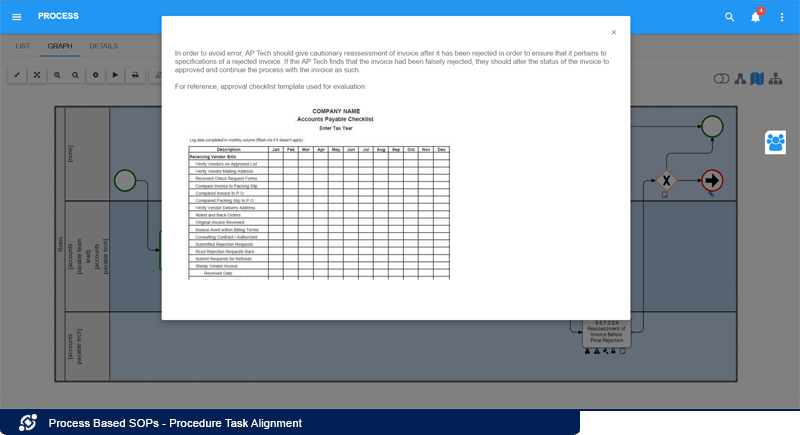 Employees can actually click arrows to navigate through their process within text procedural form so that they can read only what is pertinent to them! If a picture is worth a thousand words, a video is worth a million! This is the “YouTube” era, people are visual and will learn 10x faster by watching a short 1 minute video than by reading a 2 page document. 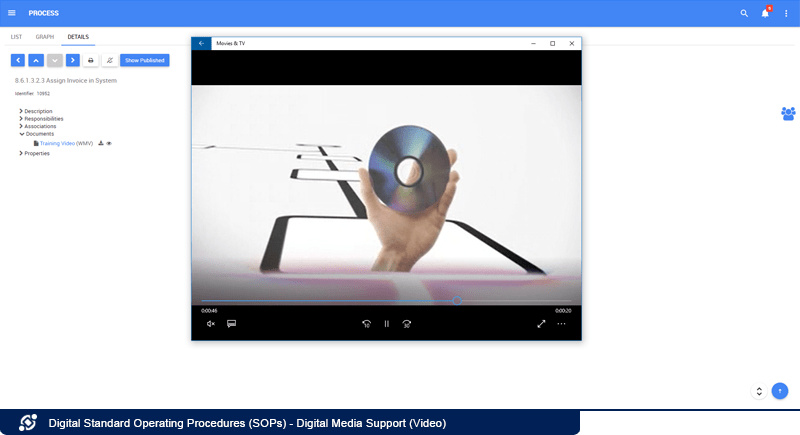 Include How-to videos (screen captures or short clips filmed on your phone) in-conjunction to your text & image based standard operating procedures can maximize user’s productivity and adoption of using/referring to a knowledge base. The EPC also supports video preview to avoid the hassle of downloading any large size videos for your end-users. 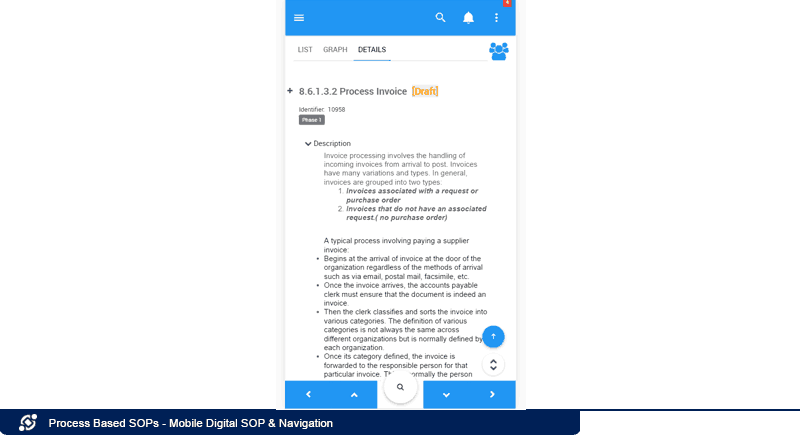 Within a digital SOP your employees not only have a clear description of “what and how” they need to do, but can also include application links to the “where” they need to do it. Additionally, if any information isn’t clear they can easily click to refer to additional external documentation for more details (eg. wikis, websites, helpfiles). 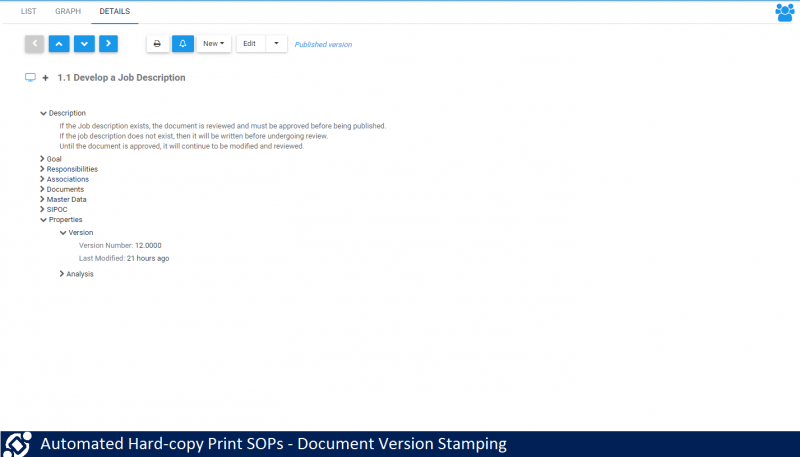 Employees can preview (vs. download) directly online Adobe PDF soft copies of the digital web-based SOPs based on your standard template. 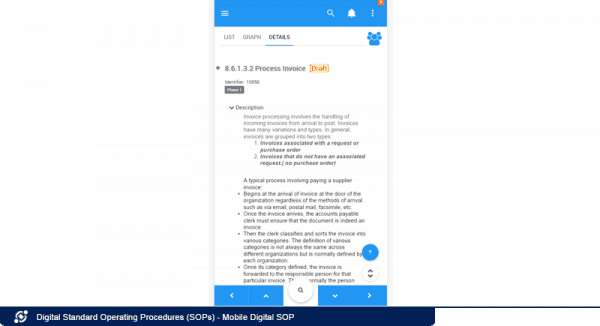 Preview allows employees to validate they found the correct document before downloading it, as well as read documents directly online without having to download (e.g., on mobile or tablet). It should also be mentioned that although documents are user-friendly and popular with end-users, downloading can run the risk of a user saving a soft-copy to their desktop locally and then not referring back to the current up-to-date version in the future. In this case, preview feature adds great value for ensuring accurate and timeliness information across the organization. 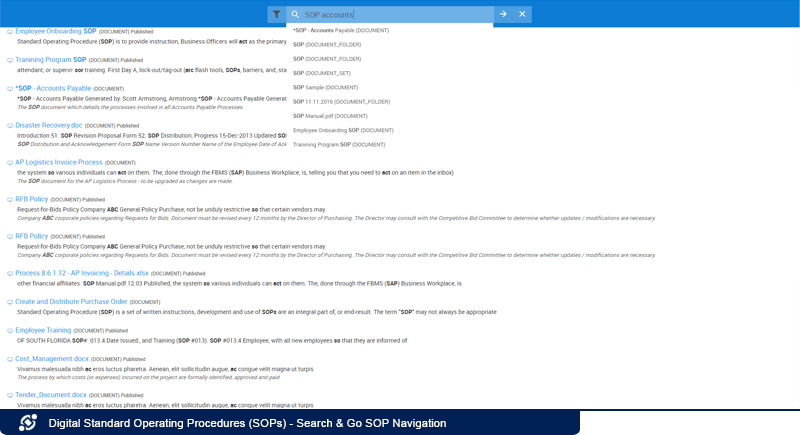 Apart from previewing SOP files directly in the EPC, users also have the option to get an integrated “Summary” of a SOP within the Process Details page. 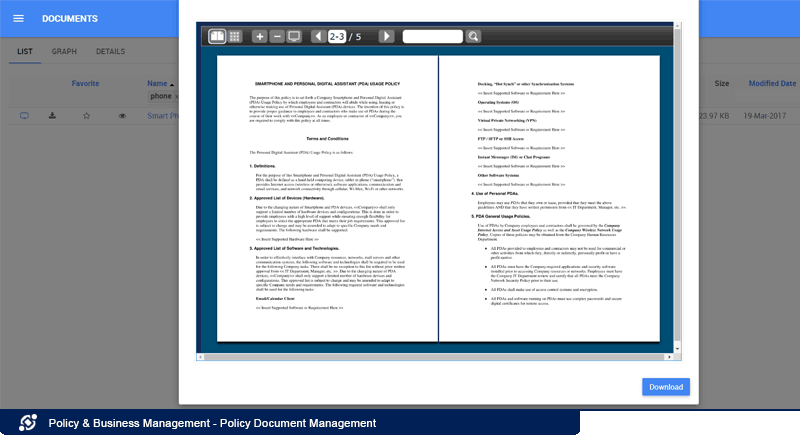 The “Summary” section includes key information (RACI, documents, risks, etc.) associated to a process and its flow-objects at a glance. 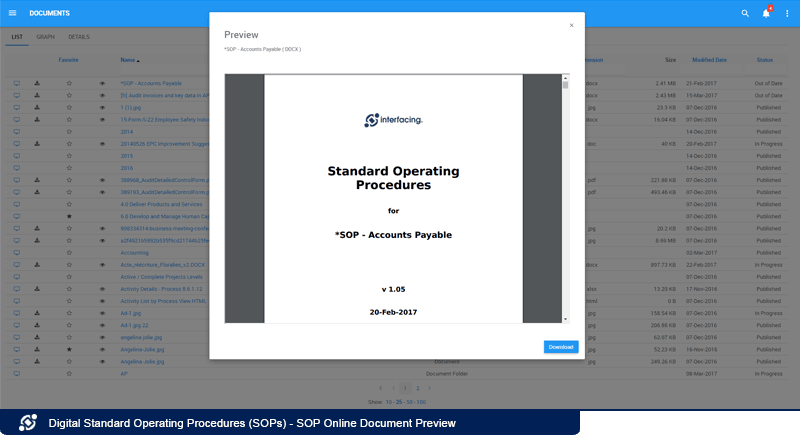 If you prefer downloading a copy instead of previewing a summary, you can get the Word file of the SOP in a second by clicking the “Process Book” button on the Details page. No more time and effort wasted on the manual creation and maintenance of standard operating procedures and work instructions! 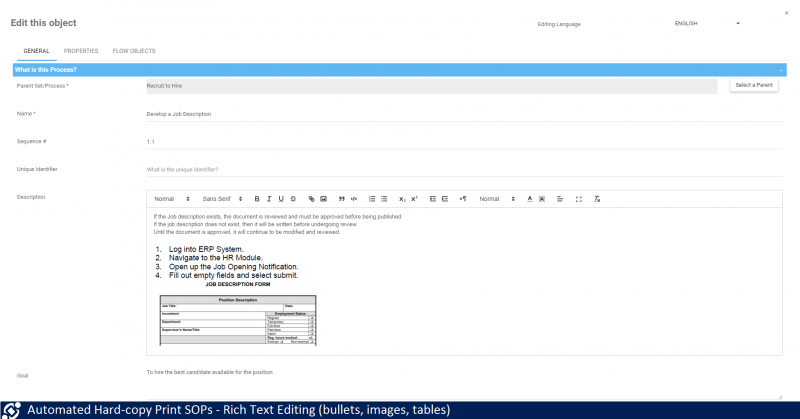 EPC has a built in document generator which creates your documents for you based on pre-configured standardized templates. This allows your team to focus on improvement, while ensuring documents are always kept to-date! 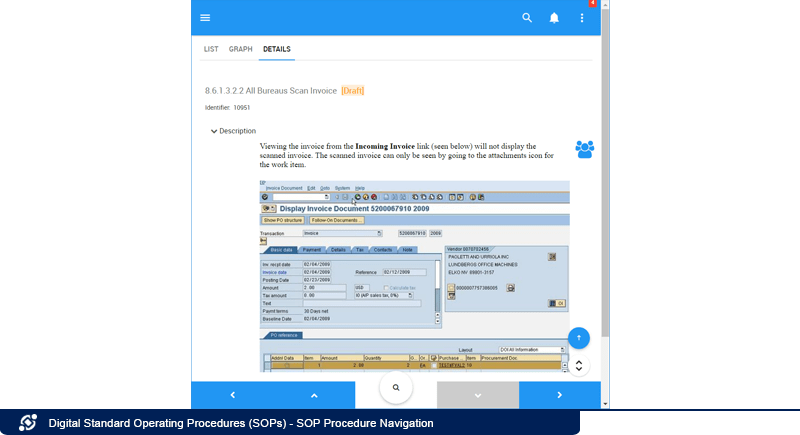 Beyond standard operating procedures (SOPs) the document generator function can also be leveraged for Requirement Documentation, Audit Reports, User Guides and Training Manuals! 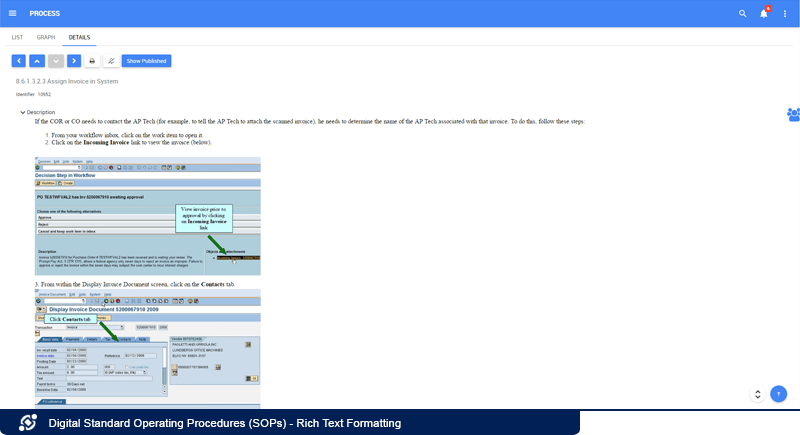 Besides building your SOP in EPC’s document generator, users also have the option to build SOP by pre-formatting their own SOP templates in Word and then uploading these files directly the EPC! In this way, users are able to create more customizable templates with the ease of using Word. 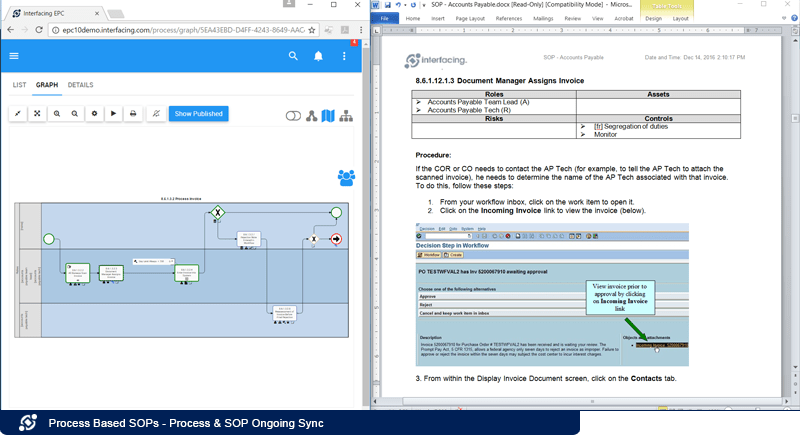 To have a SOP document that displays information from a process, users can simply add template tags directly in the pre-configured standardized file, and then upload the template into the EPC similarly to other documents. The EPC supports 5 out-of-box templates for different formats and purposes. Those different outputs can make sure that your SOP files adapt to different audiences and situations, yet remain a standardized look and feel, as well as content structure. Additionally, users can adjust the template as much as they want (e.g. including information they need) according to their needs for SOPs. Plain text is not adequate enough to provide employees with clear work instructions as to what they need to do and how they need to do it. 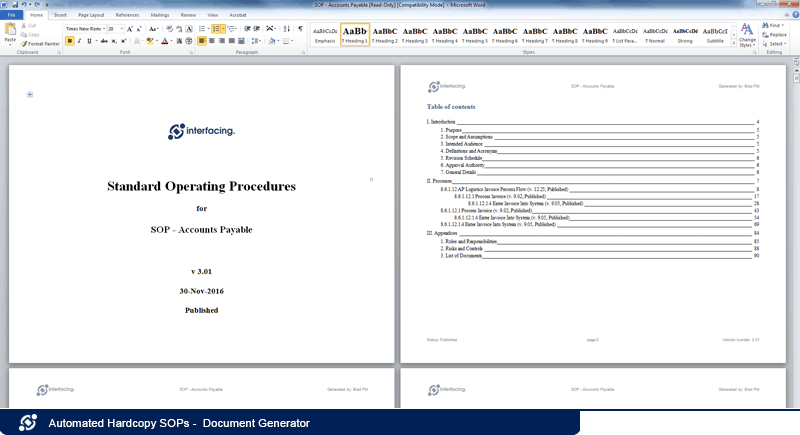 Documenting procedures requires rich text formatting capabilities, this means supporting MS Word type formatting features, such as lists (e.g. ordering of steps or priorities), embed images (e.g. an application screenshot, or supporting diagram or image of machinery), bold/italics/underline (to emphasize headers and topics), tables (to partition information within a user-friendly format), as well as videos (e.g. a How-to video to demonstrate an end-to-end operational procedure). 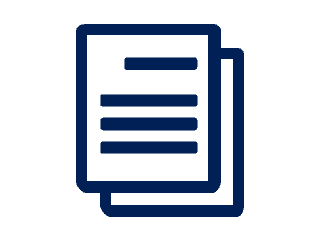 Its often hard for users to track whether or not they are using the correct version of a document or standard operating procedure once printed to hard-copy and this is the first thing auditors validate when conducting an assessment. 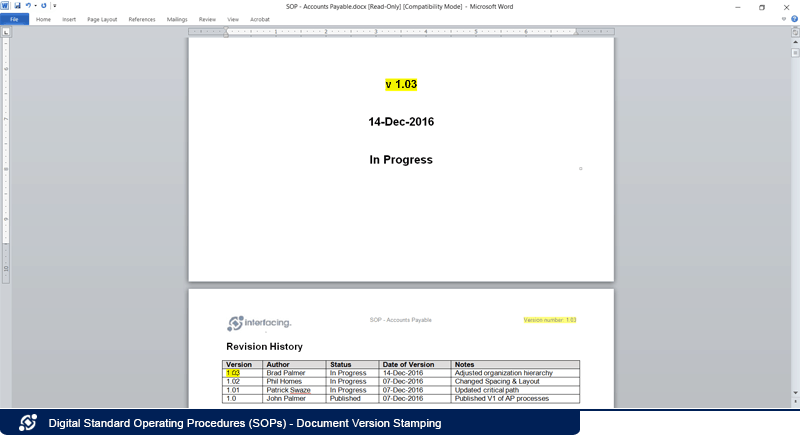 EPC automatically stamps the correct version (draft or published) within the header or footer to easily track and validate the current version vs. version utilized by employees. 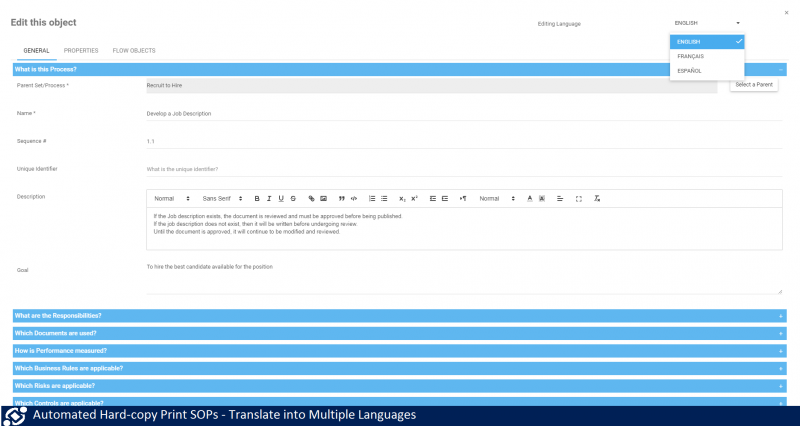 Maintain one version of the truth and minimize update efforts by translating the same content into multiple languages. The EPC supports ALL languages (Chinese, Arabic, Russian, Hebrew, etc.) and allows users to toggle all information contained within the EPC (process, procedures, documents, etc.) between multiple languages. Employees that consume standard operating procedures aren’t always familiar with international languages and hence localizing procedures is critical for understanding and adoption. The EPC serves as a process library; it contains every single activity performed by the organization within a central location. Resources can therefore follow a comprehensive set of procedures and be more confident in their work. 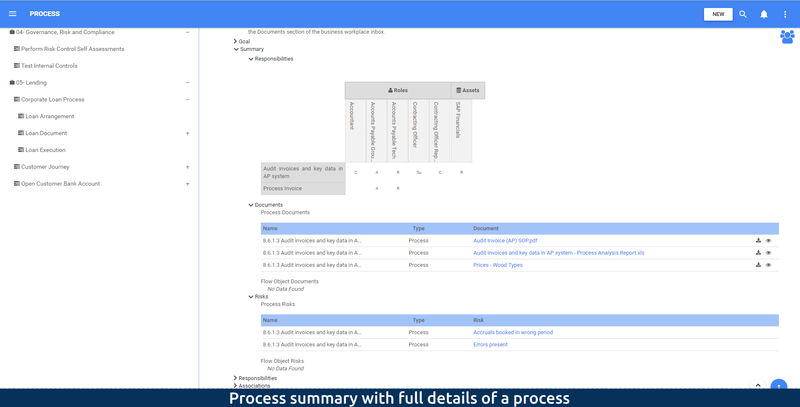 Ensure no task is missing a procedure as well as remove redundancies and inconsistencies among-st different documentation sources by capturing your step-by-step procedures directly within each specific task. This provides employees with clarity as to when and what they should be doing based on the overall process path and allows the organization to resolve knowledge gaps lacking detail. Ensure alignment between your process improvement and documentation teams by automatically keeping the correct information 100% in-sync! When a change is made to any information contained within a standard operating procedure (SOP) document (eg. 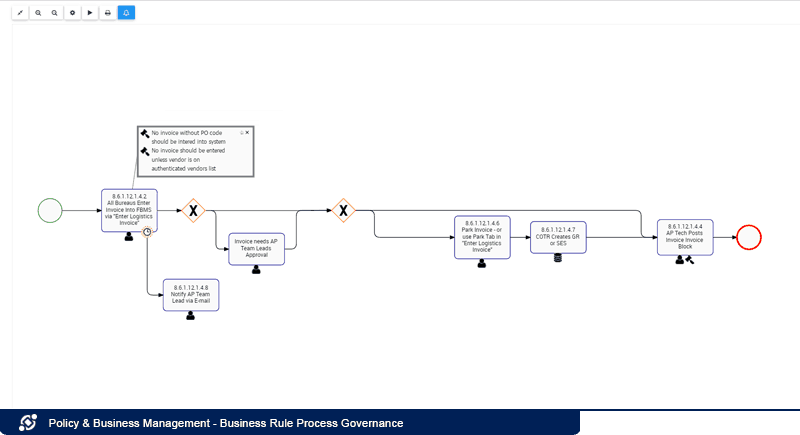 role name, business rule, process, procedure, …), the SOP (or multiple SOPs) is/are automatically marked out-of-date, the owner of the SOP is notified and if the change is approved, with a single click a new version of the entire SOP is automatically generated and published with all the correct information based on the company’s standardized template. Think of a process flowchart as the Google Map and the Procedure as the turn-by-turn instructions as to what you need to do to get to where you need to go. 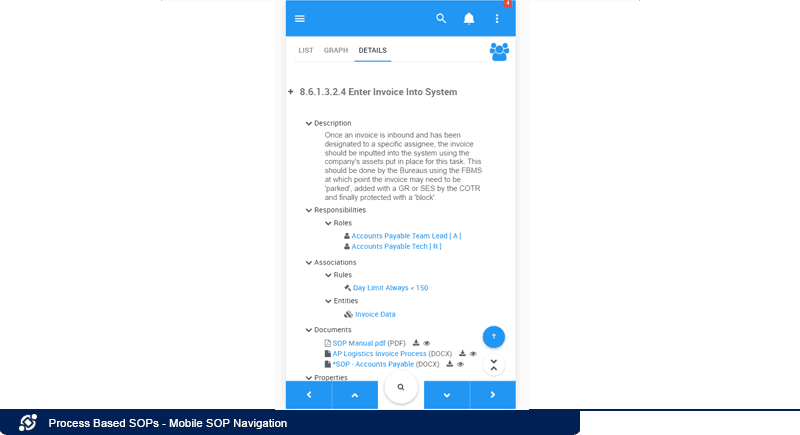 Within the EPC, employees can easily navigate through their process within the procedural form and then at any point in time gain bearing as to where they are within the big picture by toggling between the map and detailed procedure view. The EPC allows users to compare current version of a process against any past versions of the same process directly in the Graph view. By juxtaposing one version against another and highlighting changes made, users can understand the evolution of a process in a highly visualized way, also compare information such as people involved, resources used, task changed, etc. from past to present for compliance purpose. 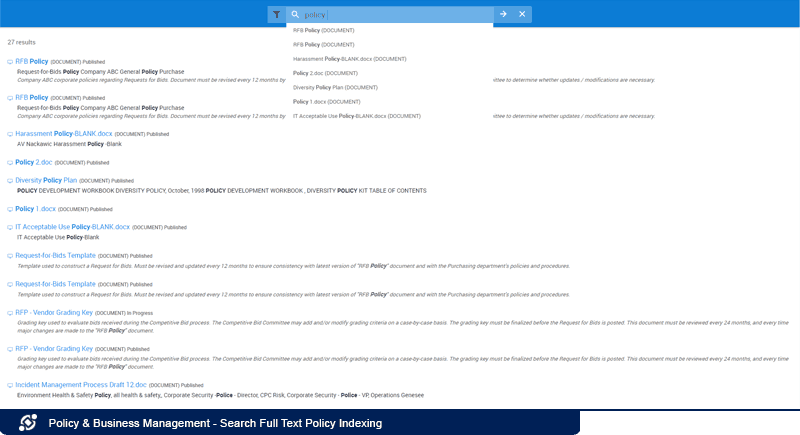 Document and manage all your Policies, Laws and Regulations within one centralized repository as well as the relationships among-st them. 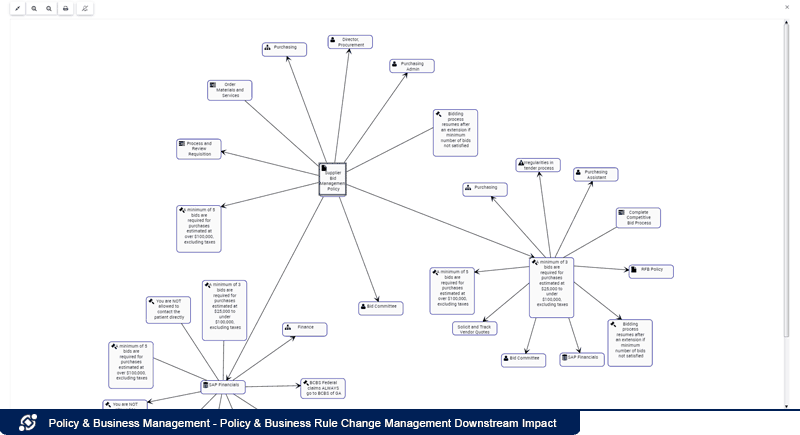 Laws and regulations change over-time outside of the companies control, when changes are applied its critical to understand the downstream impacts and required changes to corporate policies, business rules, processes, procedures and controls. Analysts can standardize and enforce company policy by modeling operations, definitions, and constraints that employees must follow through business rules. 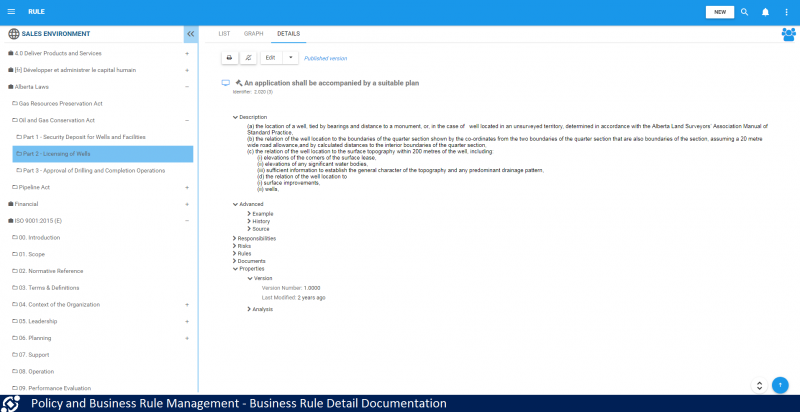 Business rules are much more narrow in focus then policies, making them more easily manageable and provide compliance and operational requirements clarity. Analysts can standardize and enforce company policy by modeling operations, definitions, and constraints that employees must follow through business rules. Employee activities can be defined and constrained according to business goals and policies by associating business rules with specific processes and tasks. This creates a direct link between corporate policy, procedures and strategy.